So you are working on a screenplay, a short story or a novel. Perhaps you’ve finished a draft, or a rewrite, you’ve gathered feedback, you feel it’s pretty much good to go. What else can you do? Not only to yourself, but to others, or with others, or have it read by others. Yes, you’ll have to leave the absolute safety of your writing den (but anyway, you’re absolutely safe only when you’re dead). Yes, this is different from sending it out and getting a rejection letter; that is delayed response, easier to deal with. Sitting through a live reading can be quite unnerving, if not outright scary, but I urge you to do it. 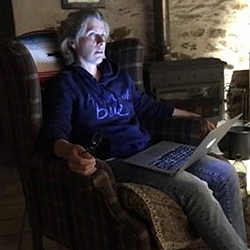 I am currently happily tucked away at a writers’ retreat in rural France. Part of this retreat are readings of everyone’s material – whether finished or unfinished, essay, novel chapter or short story. We’ve had two readings so far, and they were real eye-openers (or perhaps that should be ear-openers) for me. Read your screenplay – dialogue AND action! For our first reading, I chose a short script I recently wrote for the New York City Midnight Challenge. I’d asked some fellow residents if they would take on the characters, and I read the action lines myself. Although I had read this script perhaps 20 times on paper, hearing the dialogue and, even more so, the descriptions of the action made it clear what worked – and what didn’t. Hearing the action rather than seeing it on the page made a huge difference, and several times I thought, “how the hell is that supposed to work? !” when it hadn’t seem to be a problem on the page. It would have been even better if I’d only listened, rather than also read myself, but it was an extremely helpful experience nonetheless, especially since I plan to make this film myself sometime next year. Shortlisted for Twisted 2? Gather your friends for a spooky evening! If you’re on the short list for Create 50’s Twisted Volume 2&3, you have the option to upload one more draft. Before you sit down for this final draft, I suggest you read your story to some friends (and ideally some enemies too). That’s what I did with my shortlisted story “Bamboline”, at our second reading here. This was a different format and a different experience. My audience gasped and “uh-oh’d” at the right moments and giggled when I had hoped they would, which told me this story is ready to go out. Instant reaction like this is invaluable. It’s not analytic, it’s not applying storytelling structure and theory, it is gut reaction that tells you what works and what needs work. When your friends give you feedback a few days after having read what you’ve mailed them, they will probably have spent time thinking about how to be “nice” and give “positive comments”. But if there is no gasp when you read out a particular moment that you thought was really shocking, well, you may just have to up the shock! The deadline for the “Twisted” redrafts is 4th August. What are you waiting for? Get reading, and then polish those stories! Oh, and while you’re at it, also submit your work to the London Screenwriters’ Festival’s Actor’s Table Read – an opportunity not to be missed. PS I should add that at our readings, even those writers who were most scared to offer up their work said afterwards that they found it not only useful but also empowering. JUST DO IT! Vera Mark is a screenwriter based in Germany. Her short script “Psukhe” won the Create50 / Courage and Kindness category at the British Screenwriters’ Awards 2015, and “Sirtaki” has been selected for Create50 / The Impact. Among other works-in-progress, she has a short script scheduled to be filmed this November.